I love asking questions about the outcomes design can achieve and figuring out ways to answer those questions." Director of Research at HDR, Dr. Jeri Brittin trained as a public health research scientist, and also has a design and business background in senior-level strategic roles. Jeri’s areas of expertise include research design, intervention evaluation, and analytic approaches informed by systems science. John serves as the CEO at vSpatial and is responsible for providing vision and leadership while ensuring that day-to-day operations align with the company’s business plan. Having been born with an entrepreneurial spirit, John started his first venture at age 14, which he eventually sold to pay for law school. Prior to joining vSpatial, John enjoyed a successful legal career where he both practiced law and became passionate about remote work and bridging the generational divides that exist in today's workforce. Rob Levy is Vice President, Financial Health at CFSI where he leads the research and thought leadership practice. His portfolio includes consumer and industry research, product-level analyses, and business best practices designed to inform the marketplace on how to improve consumer financial health outcomes while generating long-term business growth. In his tenure at CFSI, Rob has led several marquee research initiatives on financial health measurement, small-dollar credit, employee financial wellness, and secured credit cards. He speaks frequently at industry and policy conferences and has been quoted in the American Banker, TechCrunch, the Atlantic, Nerdwallet, and HR.com. He has previously worked at a fintech startup and in the U.S. Senate. Rob also serves as Board President for Neighborhood Trust Federal Credit Union, a community development credit union in upper Manhattan. I'm an HR Leader with 20 years of progressive HR experience, including managing global HR, Recruiting & Office staff. I possess global HR experience in both start-up and large technology companies, but I'm passionate about helping start-ups excel through people, with extensive knowledge in the areas of recruitment, talent management, engaging work cultures, learning & development, compensation and benefits. Jaeques Koeman MSc, is CEO and co-founder of Dutch Edtech company EDIA. He has a background in Computer Science at the University of Amsterdam, specialising in the application of Artificial Intelligence in education. He has also been part of the founding team of Knowble, producing award-winning adaptive learning solutions using machine learning and natural language processing. Dr. Jamie Bracey is an educational psychologist leading Temple University’s new Center for Inclusive Competitiveness, housed at the College of Engineering. The Center’s mandate is to advance inclusive, STEM based talent development and entrepreneurship grounded in urban environmental, social and economic sustainability. Her commitment to improving quality of life through community economic development is found in her strategic service on several boards, including the City of Philadelphia Digital Literacy Alliance, the Pennsylvania Department of Education's STEM Advisory Board, the PA Computer Science for All initiative, the STEMbees Girls in STEM NGO Board (Ghana), the KAD ICT Advisory Board (Nigeria), the PA Black Women Leadership Council’s Equity Investment Fund and her recent appointment to the PA Governor's Advisory Council on Diversity, Inclusion and Small Business Opportunities. Cyrus Radfar is a serial entrepreneur and the founding partner of V1. Worldwide. Prior to V1., he was the founding engineer at AddThis (acquired by Oracle). He studied Computer Science and Psychology at Georgia Institute of Technology. Mike DeMarco is the Sr. Director of Sales at ZIVELO. He is located at the company headquarters in Scottsdale, AZ. His mission is to help companies meet the demand of their customers’ digital engagement needs through interactive kiosks and digital signage. Prior to joining ZIVELO, he led sales teams for companies like Chase Bank, Verizon Wireless and First Data. Mike is a U.S Army Veteran with service in Afghanistan and Iraq. Niko Bonatsos, Managing Director at General Catalyst, invests in first-time founders with strong product instincts, robust appetites for learning, and a desire to create innovations to benefit millions. He has been instrumental in many of GC’s investments including Snap, Atrium, ClassDojo, and Wag! Serial entrepreneur and professor in design. Kimberly Gartner is passionate about working to improve people’s lives, building sustainable businesses, and cultivating unique partnerships. She’s an expert in credit, financial inclusion, financial health, and underserved consumers. She launched the Kimberly Gartner Group, LLC in 2016 to work with good people doing good work. Growing @FlyOtto & @OpenAirplane. A professional pilot, CFI, husband, father, nerd. Passionate about user experience + aviation. Inspired by jobs to be done. University degree in English & German literature and civilisation. Master's degree in literary translation and Master's degree in technical translation. Isabel Perry is Head of Technology at Byte London, where she oversees augmented reality, AI chatbots and automation. Isabel has created chatbots for Spotify, adidas, ASOS and Just Eat. She’s also developed marketing technologies that drive automation around paid social media and analytics. Formerly both a creative and an experienced planner, she read architecture at Cambridge University. Instead of pledging full-time allegiance to a company that seemingly takes care of its employees with benefits and a trajectory for promotion, workers are increasingly piecing together gigs. The traditional private office format is being eschewed for open offices, co-working spaces, coffee shops and the comfort of home. People can take conference calls from anywhere, and collaborate in online environments, with a staggering array of tools that make geography and time zones little obstacle. Companies, meanwhile, are looking for newer, better ways to understand and reach their customers, and trying to best utilize the employees they can hire to help them do so. With these changes come incredible opportunities for companies that can innovate to take advantage of them. Multiple waves of employees are shaping workplace trends, while technology is allowing employers to reorganize and delegate tasks to them with the push of a button. At the same time, workers are charged with organizing the paths for navigating jobs and careers, making money, and finding meaning in what they do. V1 Worldwide has identified four trends intrinsically connected to the world of work. For the first time in history, five generations are working side-by-side. Employers hoping to maximize their productivity and also employee satisfaction need to understand and incorporate what drives each generation, both to draw and retain top talent. More people worldwide are choosing self-employed gig work over traditional employment. That gives employers the opportunity to scale faster, but also can present challenges when it comes to building a strong company culture and achieving employee loyalty. Diversity is an important topic today, with many companies striving to make inclusivity a hallmark and their workforces reflective of their customer base at large. Race and gender are two elements often used for benchmarking progress in this arena. AI’s impact on our daily lives, inclusive of our workplaces – not to mention our commutes to and from them – keeps growing, and so it’s frequently heralded in the public eye as an emergent sector just taking wing. But despite its trending status, some of the experts interviewed by V1 posit that the “AI revolution” has already taken place. The first trend is around the workers themselves, that is, the generations that make up the fabric of the workplace today and will in the years ahead. The second topic V1 addresses is the gig economy, which is increasingly encroaching on the universe of full-time employment, giving workers more choices but less of a safety net. The third area of interest is diversity, which has implications for both company culture and understanding customers. Finally, V1 looks at AI and automation, which continue to enable innovation in industries across the board. In order to best understand the current state of work and its future, V1 spoke with founders, executives, academics and analysts from a host of different industries, with the aim of putting them in conversation with one another around these trends. V1 spoke with them about their personal experiences throughout their careers: how the identified trends have evolved to shape their businesses and industries, and what kinds of future developments they expect to disrupt the status quo. In addition to sharing insight into the changing world of work, this report also sets out to provide employers and employees with suggestions of steps they can take to keep pace in this rapidly evolving environment. V1 asked experts to speak about the major pain points and developments affecting their businesses, and used their input on these issues to build out each of the four major trends. V1 also chose to include insights from founder, Cyrus Radfar, to provide the company’s take on the topics. Together, they provide a window into the workplace that employers and employees can use to better position themselves for success. Today’s workplace is complicated. For the first time in history, five generations are working side-by-side. Advances in healthcare and later retirement have put traditionalists, baby boomers, Gen Xers, millennials and Gen Zers in the office together. And while this generates a wealth of knowledge and experience employers can draw from, it also presents significant challenges. Each group has different expectations, driven by the cultural norms of its time, as to how the experience of work should play out. There are plenty of cliches associated with each generation, but employers have to look beyond them to get the best from their employees. In order to succeed, they need to be tuned in to the nuanced differences between the generations, and what each generation requires in order to shine. For many employers, appealing to the younger generations is key, given their sizable presence in the labor pool. As of 2017, millennials, born between 1981 and 1996,1 made up the largest generation in the US workforce at 56 million.2 Baby boomers and Gen Xers are still a sizable component, however, making up 25 percent and 33 percent of the workforce, respectively. And considering that Gen Xers, aged 38 to 53, are still some two decades away from beginning their exodus from the workforce, it’s important for employers to put significant effort into integrating the age groups at work. It’s a generation focused on building careers quickly and rising through the ranks faster than ever before, says Jacques Koeman, managing director of Dutch Educational Technology company EDIA. But this fast-paced attitude towards work could also be a cause for concern in some respects, experts say, citing a sense of entitlement 5 that sometimes leads to unrealistic expectations which is followed by disappointment on the part of millennial employees. Employee perks is one area where a deep understanding of the different generations’ needs comes into play. The traditionalist and baby boomer generations value more conventional perks from an employer, such as higher salaries and promotion opportunities;7 where as Gen Xers and millennials are more interested in experiential rewards, workplace culture and feedback. Older generations, on the other hand, have been attracted to health and retirement benefits, says Niko Bonatsos, managing director at San Francisco-based venture capital company General Catalyst. Gen Xers and millennials expect more imaginative perks, which could include anything from maternity leave to pet insurance, says Bonatsos. The focus, he emphasizes, is understanding and appealing to the employees’ lifestyle needs. Doing so means employers have a better chance of attracting and retaining talent from multiple generations. Considered the most loyal generation of workers in the workforce today, traditionalists often stay at one organization for their entire career. They are engaged, they are content to follow authority, and stability is important to them. Baby boomers value teamwork and community. They appreciate open communication and are keen to ask questions in the workplace. 62% of Boomers health insurance as the most important benefit versus 44% of Millennials. Gen Xers appreciate strong authority figures who they can learn from and value flexibility in their approach to work. They are capable of adapting to new technologies. Millennials are a highly educated and independent generation. They appreciate being recognized for their accomplishments. They value achievements, education, competition, attention and globalism. They’re often highly capable of working with technology, and they appreciate companies that adopt the latest technologies in the workplace. Gen Zers grew up in a period of economic volatility, and therefore want stability in their careers. They’re attracted to work that is creative, allows for entrepreneurial attitudes, and incorporates cutting-edge technologies. The majority of millennials consider the latest technology a major factor when choosing an employer, according to a 2015 survey by Microsoft and SurveyMonkey.9 Companies that don’t upgrade their operations could miss out on desirable candidates, who will choose to work for companies that offer them access to the most recent tools. However, pairing the latest technology with a multigenerational workforce is no small task. While some experts interviewed by V1 say that they believe there’s little difference in how generations interact with technology, the majority agreed that the younger generations are overall quicker and more eager to adapt to new technology in the workplace. That’s not to say that older generations can’t or won’t adapt to new technologies. 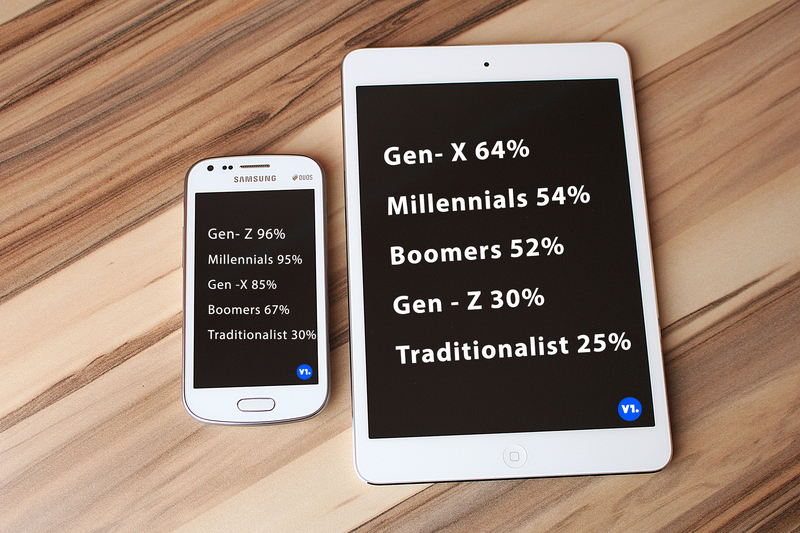 Pew research shows that while younger generations are first adopters of new technology and online trends, older generations often catch up.11 For example, the number of millennials on social media rose by just four percentage points between 2012 and 2018, compared to 11, 17 and 8 points among Gen Xers, baby boomers and traditionalists, respectively. That’s not to say that older generations can’t or won’t adapt to new technologies. Pew research shows that while younger generations are first adopters of new technology and online trends, older generations often catch up.11 For example, the number of millennials on social media rose by just four percentage points between 2012 and 2018, compared to 11, 17 and 8 points among Gen Xers, baby boomers and traditionalists, respectively. To maximize efficiency among different generations when it comes to the use of technology, employers need to develop tools with multiple age groups in mind, says CFSI’s Levy. “You can’t make assumptions about how consumers of different generations will use technology and what they’ll understand. This is just good user testing for any product. Especially when you’re designing something that’s not intended for consumers similar to you, you’ve got to test it frequently with the actual end user." Employees, meanwhile, need to be tech-savvy to make the most of employment opportunities, according to V1 interviews. If the older generations fail to adapt to new technologies, they risk being left by the wayside in a workplace that will become increasingly tech-centric, as well as dominated by millennials and Gen Zers. Technology will continue to evolve, and innovation will reshape the workplace. Generational representation in that workplace will be influenced by both the demographic factors already at play, and the extent to which employees and employers succeed in creating a common language and comfort around the tools they use. When it comes to jobs, millennials aren’t committing to one company for long stretches like the generations before them. A 2016 Gallup report found that 21 percent of millennials changed jobs within the previous year prior to the report’s publication, which is more than three times the number of non-millennials.12 And LinkedIn research reports that early in their careers, professionals who graduated between 2006 and 2010 typically stuck with an employer for a year and nine months. Professionals who graduated 20 years earlier, meanwhile, stayed at jobs almost a year-and-a-half longer.13 A few decades ago, someone who took a new job every three or four years raised red flags, says Bob Lehto, Vice-president of Human Resources at financial services company BRD. Not so anymore. “I feel like we’re at a point, in the world of work, where we have more choices,” explains Lehto, who accepted a new position after just under a year at his last company. Lehto says that despite falling into the Gen X age bracket, he actually identifies more as a millennial. “I think intrinsic motivation and self-realization, being able to really have an impact in the role that one plays, and being able to have the freedom to choose to work at a company that is in turn having an impact in their industry or in their community, makes this a really exciting time to be part of work,” he says. Gen Zers, the next working generation, are expected to be on the move too, but within, as opposed to between, companies. Set to make up 24 percent of the workforce by 2020,14 they’re more likely to “role hop” as opposed to job hopping in the same way as their millennial peers, reports suggest.15 Instead of changing companies, say experts, they might choose to try on many hats at one company that allows them the diversity of experience. 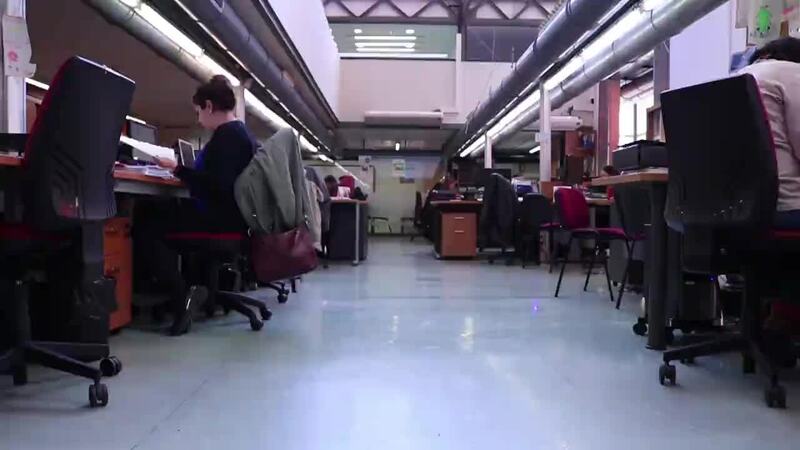 Employers looking to the future will need to focus on making their workplaces Gen Z friendly. Not only does this mean equipping them with the most user friendly technology and giving them the perks they expect, it also means preparing for a more transient workforce that is likely to want to move within their industry and within the organization they work for. A few decades ago,someone who took a new job every three or four years raised red flags. Companies that can tap into the expertise of multiple generations in the workplace have a distinct advantage when it comes to learning and applying skills to creatively problem-solve. They’re able to benefit from the experiences and perspectives each generation brings, even though they also have to juggle the eagerness for new, fresh and fast with the wisdom that comes from more measured, tried approaches. Getting those employees in the door and keeping them – especially when each generation brings such different expectations to the table – can be tricky, but doable if the employer can remember to be sensitive to each generation’s needs. Poor communication sometimes results from misunderstandings across the groups. Traditionalists, baby boomers and Gen Xers sometimes look down on their younger counterparts as entitled and even lazy. Their younger counterparts often speak their minds more freely. While traditionalists, baby boomers and Gen Xers often have a more pragmatic approach to work, millennials and Gen Zers expect more from their employers. They want their employer to have a mission that they can relate to; they expect their employers to respect their need for human growth, both in and out of the office; and they appreciate flexibility in their roles. These are traits that every generation can benefit from, so it’s important for employers to recognize them and try to implement them in the workplace. Those that do will be better able to appeal to the multiple generations in today’s workplace. As of 2016, 20 to 30 percent of the labor force in the US and EU-15 engaged in independent work.19 The most recent wave of gig opportunities has been driven by both technology and the economic climate. Online platforms such as Craigslist, which was launched in 1996, provided a global platform for employers and gig workers to meet, and the industry proliferated in the early 2000s in response to the dot-com crash. The 2008 financial crisis also helped propel the gig economy forward, says Lehto. “A lot of amazing, bright people couldn’t get jobs right out of college, and people that felt they had given strong commitments to their companies were suddenly out of a job,” he says. “They felt they’d fulfilled their end of the bargain and employers did not.” People explored new avenues, becoming self-employed and taking business risks, because their other employment options were limited, he says. Just as online platforms like Craigslist boosted the gig economy at the turn of the century, the introduction and proliferation of smartphones starting around 2007 allowed for a new type of gig work to exist. With app culture and GPS, it was possible for on-demand businesses such as rideshare company Uber and online food ordering company Deliveroo to exist. Companies like these could now interact with their employees, send them work and instructions, and pay them, all through their smartphones. “Such developments made it feasible, and even, attractive, for more people to work on a gig basis and remotely." Improvements in technology and also in attitudes toward gig work have made the gig economy and remote work more appealing and more viable. It’s become accepted to be part of a team working out of a variety of locations, says The Gig Is Up’s author, Olga Mizrahi, who started a virtual creative agency in 2004. She says that some companies, and especially large clients, previously weren’t comfortable working with remote teams without brick-and-mortar offices. You can see how somebody is connected to others that you know, because you can see somebody’s online reputation, what that person has said. This cultural shift comes in part thanks to a steady increase in online trust. The rise of social media and app culture has meant that people have more confidence in forging virtual relationships. “Online trust has been much more available today, or defined in a different way than before,” says Bonatsos. The rising trend of gig work has been enabled in many ways by technology, but its growth has been propelled by an increasing trust in the tools associated with the gig economy, as well as the proficiency of gig and remote workers. As more businesses see the benefits of hiring gig workers, the gig economy trend is likely to continue. Gig workers come at a “much lower price”, asserts Per Cromwell, CEO and co-founder The Moby Mart. Some estimates suggest that employers could save at least 20 percent a year by working with gig workers rather than traditional, full-time employees, as temporary workers don’t require benefits. And that’s not even taking into account the savings made in office space by working with remote gig employees. When Zivelo was going through a period of rapid growth, the company relied on hiring gig workers in order to be able to keep up with the pace, says Mike DeMarco, senior director of sales. And Cromwell agrees, describing the gig economy as a “buffer” where employers can pick employees for one-off, specific tasks..
Tom McLeod, founder and CEO of San Francisco-based Omni, prefers to work with full-time employees, as it allows for a shared corporate vision and ensures a higher quality of service. He says this is difficult to achieve with a team of gig workers. As a self-employed consultant, it can sometimes be tough to convince organizations and prospective clients that she’s as serious about her work as any full-timer, says Kimberley Gartner. Some people assume that being self-employed and taking on gig work is just a period of transition, as opposed to a career choice, she explains. Despite cultural changes and the rise of gig work, many employers still favor full-time workers. Their ongoing connection to the company means they’re more likely to deliver high quality results, in part because they have more skin in the game, several experts interviewed by V1 suggest. Many, including small businesses without the resources to compete with larger peers, see the gig economy as a boon for business. Sweden-based entrepreneur Per Cromwell, CEO and co-founder of mobile supermarket The Moby Mart, says that while the quality of gig workers can be hit-and-miss, for him, the lower fees commanded by gig workers make up for it. The gig economy offers some attractive choices. Gig workers have the ability to set their own schedules, select who they work for and the types of work they do. But that wasn’t always the case. Before the rise of smartphone technology and global gig economy platforms, individuals looking for supplemental income were often limited to specific industries, such as hospitality and retail. “Now there are platforms that offer you the opportunity to work a few hours every day, whenever you want, and have some extra income.” says General Catalyst’s Bonatsos. Those platforms open up opportunities for workers from a range of demographics, he adds. Retired individuals looking to earn extra cash and stay involved in the labor force might get a job at Uber, for example, instead of serving tables in a restaurant. The gig economy is made up of four types of workers, according to a 2016 study by McKinsey.20 That’s 30 percent “free agents” for whom independent work is a choice, 40 percent who use independent work for supplemental income by choice, 14 percent of people who would prefer traditional jobs but make their living from independent work, and 16 percent who do supplemental independent work to help make ends meet, the study says. Still, as a self-employed worker, she says, it can sometimes be tough to convince organizations and prospective clients that she’s as dedicated to her work as a full-time employee within a company, and making a career choice as opposed to being in a period of transition. Furthermore, some of the experts interviewed by V1 expressed concern that today’s gig economy is leading to a number of problems for both organizations and individuals. V1’s Radfar says that gig work leads to a lot of anxiety on both ends. “Gig workers are constantly worried employers are going to stop needing them, and employers are constantly worried gig workers are going to find a better rate elsewhere,” he says, speaking as an employer. Dr. Jamie Bracey, director at the Center for Inclusive Competitiveness at Temple University College of Engineering, says she is particularly worried about the effect that the gig economy will have on individuals. “Gig workers are increasingly vulnerable to these intense, short-term, no-benefits assignments that don't provide financial security, or pathways to onboard into career paths,” she says. Other experts interviewed by V1 also expressed concern that the rising gig economy could be exploitative to lower-income and less-educated individuals. CFSI’s Levy says he believes that a lack of benefits could cause a bifurcation of gig workers, some of whom have the income and education to know about health and disability insurance and pensions, and those that don’t. The gig economy isn’t going away. That is, in part, because remote, gig work appeals to the millennial generation, says vSpatial’s Sallaway." Data from McKinsey also suggests that the gig economy is set to continue its rise in the coming years, based on “the stated aspirations of individuals and growing demand for services from consumers and organizations alike.”23 The technology that enables the gig economy is also likely to help make it more enticing to both organizations and individuals, say experts interviewed by V1. Sallaway says he sees virtual reality as an enabler for anyone who wants or needs to be connected to a coworker or a client that can’t physically be in the same place, adding that he believes such technology is central to helping people be better at their jobs. It means putting people in the “same room”, to give them the sense that they’re together, and also giving them the ability to interact with different 3D models in a virtual environment. “VR and AR in general are going to open up a world of opportunities for people who are really talented but simply can’t travel to a major metropolitan area every day to work.There are talented, amazing people all over the world who are suddenly going to be able to tap into this economy because of VR and AR who were previously excluded from the market,” he explains. As the tools that facilitate the gig economy improve, and it becomes more of a cultural norm in business circles, an increasing number of employers will outsource tasks to gig workers. There are, of course, problematic features of the gig economy. For workers, there’s the risk that they will be dropped unexpectedly by an employer, leaving a hole in their earnings; and for employers, gig workers committed to the long-term vision of a company can be hard to find. For both workers and employers, it’s important to be aware of the risks involved with the gig economy. Gig workers need to avoid committing too much of their time to an employer that is unwilling to provide them with security, so as to avoid being left in a financially precarious situation. And employers should be aware of the steps they need to take to hire the best gig workers for their company. Young companies and startups often engage with the gig economy in order to maximize on early projects without paying the overhead of a full-time staff. And while this makes fiscal sense, it is risky from an employee retention point of view. Founders running teams of gig workers often feel an inordinate amount of stress and pressure, having to manage a company without partners or fellow stakeholders who are equally as invested in the success of the company. Those entrepreneurs looking to start a company using gig workers as a way of mitigating the higher costs of full-time workers should consider going into business with culturally aligned partners, who can not only bear the workload, but also share the stresses that come with being a business owner. Many of the steps that employers need to follow before taking on a new gig worker are similar to those of the traditional hiring process: make sure prospective workers have relevant references; that they have a good history of work and/or portfolio; and that the worker is eased into the company via a pilot project rather than one that is integral to the success of the company, so that the employer can evaluate the worker’s communication and planning skills, and whether they gel with the general culture of the team. Ideally, companies would avoid relying on gig workers on a regular basis. Of course, doing so can be a valuable tool to push through projects during busy periods of work; however, the transient and non-committal nature of gig workers means they are less desirable than full-time workers who are more likely to become ingrained in a company’s culture. Diversity is an important topic today, with many companies striving to make inclusivity a hallmark and their workforces reflective of their customer bases at large. Race and gender are two elements often used for benchmarking progress in this arena. According to the Bureau of Labor Statistics, as of 2017, 21.6 percent of the working population was non-white,25 compared to 16.5 percent in 2000.26 Women’s representation in the workplace has also risen just over 2 percent in that time, to 47.7 percent in 2016 from 46.6 percent in 2000. While these changes may seem small, especially women’s representation in the workplace, they are indicative of a rising trend in diversity. Temple University College of Engineering’s Bracey says in her career, which has included work as a corporate marketing executive and nonprofit executive, independent consultant and education leader, she’s seen a commitment to diversity as a core operating value. V1’s Radfar, who started working on product teams in 2004, says it’s been tough to improve gender diversity, especially when it comes to finding technical talent. “One of the very subtle issues is in the hiring criterion, people don’t like the gaps that happen when people have children – when people have large gaps.” That puts women at a disadvantage, he says, in some instances meaning they don’t make it past the recruiter’s quick filter. A senior role is ten years’ experience for his company. Asians make up 6% of the workforce and earn $1043 per week, while Hispanics earn $655 per week. vSpatial’s Sallaway, who graduated from law school in 2006, says he’s seeing more of a concerted effort by companies to be diverse in their hiring. His company has had a hard time creating a diverse workforce, like many of its peers, because of who largely applies to software developer jobs, he explains. And the stats back up his claim. According to 2017 Bureau of Labor Statistics, just 22.6 percent of professional computer programmers are female, and black, Asian and Latino programmers account for a total of about 34 percent of programmers in the US.28 “That’s something I would love to see changed,” says Sallaway. It’s important from a business point of view in addition to societally, because building a product for the masses necessitates having their insights into what’s being built, Sallaway explains. “It’s not just going to magically fix itself, it’s going to take people talking about it and making it a priority, but I believe that’s happening. I do think it’s improving.” He believes that companies are making a concerted effort in their hiring, but acknowledges that it will require more action. “It’s probably not something that’s just going to happen without talking about it and without making it a priority,” he says. Omni’s McLeod says the company has a diverse workforce at every level, including different genders, life stages and ethnicities. “Diverse teams are good for society in general, and working alongside people from different backgrounds helps expand everyone’s worldview. This produces better results in the workplace because everyone brings their unique perspective to problem-solving and collaborating. Homogeneous teams can’t maintain the level of excellence we expect at Omni,” he says. In addition to generally supporting the practice, McLeod says it’s practical to have people from different experiences, especially given Omni’s diverse customer base. “A huge amount of stuff that comes into Omni is baby stuff, but the fact that we have a bunch of working parents that work in our warehouse and know how to properly photograph them, take care of those items and store them in a way that's folded nicely, that actually increases value,” he says by way of example. It’s not easy, though. Like other companies, Omni struggles and strives to fill roles with the diversity the company seeks. “If you’re dealing with a diverse set of inputs, I think it’s important to have a diverse set of handlers for those to get the right results, so for us that’s what we’ve been focusing on,” he explains. There are direct benefits to hiring a culturally diverse team, adds The Moby Mart’s Cromwell. Local knowledge can provide much-needed insight, he explains, citing his company’s recent work in China and the challenges of operating without an area expert. “You need to know the culture, you need to know how to navigate, you need to understand that you need to visit vendors frequently in order to maintain quality control, and as a Westerner, it’s very difficult to understand Chinese business culture,” he says. Evidence from reports suggest that companies can benefit fiscally, experientially and culturally from hiring diverse teams of workers, and experts interviewed by V1 agree that diversity has a direct, positive impact on their businesses. However, despite a growing pool of diverse talent in different industries, some employers are still struggling to achieve a diverse workforce. It’s the responsibility of a CEO or founder to understand the need for diversity and push to make it happen at every stage of the company’s growth." While V1 interviewees stressed that diversity is more than just a buzzword, they also emphasized the difficulties associated with achieving it. Between the challenges of finding the right people to make up the ideal balance and the host of underlying complications that can make hiring them tough, it’s an arena where there’s still more work to be done, they largely agree. How to best get from here to there remains somewhat of a moving target for the time being. Omni’s McLeod suggests that companies that are struggling to create a diverse workforce can look within their own organization and improve opportunities for existing employees to keep from having a "funnel issue" where roles/departments are skewed by race, ethnicity or gender. Employers across all industries wishing to build a diverse workforce often need to make an affirmative decision to do so. General Catalyst’s Bonatsos says that creating an inclusive culture starts early on, adding that it’s the responsibility of a CEO or founder to understand the need for diversity and push to make it happen at every stage of the company’s growth. Everyone brings their unique experiences to the workplace. Those experiences inform how they work, how they look at a company’s processes and how they do their jobs. And the more perspectives a company can not only empathize with but also incorporate into how they understand their products and serve their customers, the more effective they have the opportunity to be. By having employees who represent a multitude of diverse perspectives, companies can make sure they’re meeting the needs of different demographics and delivering experiences that match customers’ expectations. That diversity of experience comes from bringing people together from different places, cultures, socioeconomic backgrounds and belief systems. Generating it, that is, building the workplace that can reflect and incorporate these elements, takes work and planning. It often happens more organically with remote teams; employees are generally spread out geographically and so people come from different environments, which can lead to them to having significantly different backgrounds and outlooks. For teams that share physical space, recruiting from a broad pool of candidates plays a big role in promoting diversity. So does making sure the company advertises positions broadly enough for it to reach beyond an immediate audience of self-selected, like-minded job seekers. Finding places where people from other perspectives spend time and distributing job applications there can be a start, as can participating in forums and presenting to associations whose membership might be reflective of the company’s customer base. Companies can sponsor youth events in a community it would like to reach in order to develop relationships and source employees, or hold an event for older adults to help add their wisdom – which can ideally stop a group from making the same mistakes over and over – to the mix. Building diversity is achieved by starting with curious and open management, leadership that at its core wants to understand the human experience better. It’s then built further from the desire to make sure the company isn’t missing out on knowing about the people it serves and what would serve them better that could otherwise help the business grow. After all, the next big idea could well come from someone outside of the leadership’s immediate circle, who’s coming from a totally new perspective. There seems to be some confusion around whether the AI revolution has yet come and gone. AI’s impact on our daily lives, inclusive of our workplaces – not to mention our commutes to and from them – keeps growing, and so it’s frequently heralded in the public eye as an emergent sector just taking wing. But despite its trending status, some of the experts interviewed by V1 posit that the “AI revolution” has already taken place. Jacques Koeman, who founded his business which specializes in the application of AI technology in education in 2002, says that much of the technology people are discussing today has actually been around for more than a decade. The difference is that now the technology is more widely used and trusted. Koeman explains that he had difficulty commercializing AI-powered products because of the public mistrust, and that it wasn’t until the past few years, when consumers could see the direct benefits of AI technology, that perceptions began to shift. He says that highly publicized technologies such as Netflix and self-driving cars made the difference. “[They] created a turn, so when consumers were using, partly unconsciously, so much data-driven technology, companies could really see the benefits of investing more in it.” It was at this point that Koeman’s company began to be more open and promote its product as AI-powered technology”, he says. Even if the AI revolution has come and gone, the applications of the technologies are still current, particularly as more small and medium-sized businesses start using them. In 1900, over 40 percent of the US population was engaged in agriculture. Now the number is below 2 percent. The automobile destroyed 623,000 jobs between 1910 and 1950. But it created 7.5 million jobs in that time, at a net gain of 6.9 million jobs in the US. The first automated teller machine (ATM) was introduced in 1967. It began the automation of the finance sector. 1992 was the first time a multi-function robot carried out an operation. Its name was Robodoc. Supervised by a human surgeon at Sutter General Hospital in Sacramento, California, Robodoc drilled the cavity in the patient’s femur into which one half of the prosthetic joint was fitted more precisely than a human surgeon could. In January 2018, Apple reported that developers had earned $86 billion since its App Store launched in July 2008. Ford announced it is going to be investing $1 billion in Argo AI. The robotics company was created by former Google and Uber leaders. Ford plans to combine the expertise of Argo AI with its existing self-driving car efforts to have a “fully autonomous vehicle” coming in 2021. Automation technology is no longer just for the biggest businesses in the world. It’s also helping small businesses to better compete. Rod Rakic says automation helped his business, FlyOtto, which caters to small airlines that fly into and out of some of the country’s 5,000 airports, to build its marketplace. “We built the technology, and the automation in our algorithm allows us to do something that replaces what the charter companies do,” he explains. Charter companies often use a string and a map to determine the cost of a trip – nine inches will mean $9,000. They quote that trip rate to the broker over the phone, who turns around and sells the ride from $15,000, pocketing the difference. “We have flipped the script on that by using the algorithm we built to drive FlyOtto,” he says. That means savings and speed. “So now, the automation allows for us to be able to tell you what the retail price of the trip will be in seconds, not hours.” Technology, which in this case aggregates demand, creates an opportunity for them to do more business, he explains. Big data and AI technologies are also creating opportunities in the design and workspace industry, says Dr. Jeri Brittin, director of research at HDR. “That’s another hot trend right now – big data and leveraging big data,” she says. “Everyone says they’re doing it, but there are still limitations. One of the things we are actively working on is to bring masses of data about projects and outcomes into a manageable, understandable format, so that we can better analyze how design decisions impact people. We’ve made great strides, but there’s still a lot of work to do to leverage the full potential as well as to address potential inherent biases." The technology is also helping employees who are working with AI-powered automation, claim some of the experts. V1’s Radfar suggests that the tools will makes people’s jobs easier, and that it will help them to better focus. “The ideal is that you automate away a lot of the things that distract, and you allow them to focus,” he says. Similarly, Koeman says that automation technology is performing a lot of the “boring, time-consuming work” that nobody wants to be doing. Software developer Hubspot has continued to grow steadily since it launched 12 years ago. The Massachusetts-based company offers its customers an all-in-one automation platform dedicated to supporting marketing and sales that helps with social media, content management , web analytics and SEO. Hubspot enables small internal marketing teams to efficiently produce the work of larger teams. The platform cuts down on menial marketing tasks and helps companies monitor the big picture. In 2017. Hubspot generated $375.6 million in revenue, $356.7 million came from subscriptions. Launched in 2014, MeetEdgar provides a solution to the endless spreadsheets marketers normally need to manage social media accounts. The platform’s automation software reshares users’ content over time, automatically posting across social media. While there are similar platforms available, MeetEdgar is the only one that allow users to build internal content libraries to enable users to share their most important stories. Chatbot technology is one of the latest trends around AI technology, and a holy grail for marketers and businesses of all sizes. One of the leading companies that provides chatbot services to businesses is MobileMonkey. Launched in 2017, MobileMonkey works on messaging platforms such as Facebook, and is used by small local companies looking to take advantage of local business, as well as larger brands trying to find an easy, automated way to communicate with millions of followers. Founded in 2011, Zapier is a San Francisco-based automation service that provides workflows that "connect the dots" between different applications on the web. It allows users to automate many admin or operational processes between apps that they use every day. Zapier has a quick learning curve, and users can begin creating automation workflows in minutes. The company’s workforce is 100 percent remote, and consists of 125 employees based around the United States and in 13 countries. Founded in 2015, Phrasee is a London-based company that uses AI-powered tools to help businesses with their audience engagement. Using data from past email, Facebook and Push campaigns, Phrasee software creates unique copy from scratch for a company’s marketing campaign. Its natural language generation system also updates itself according to the campaign’s results, meaning the software is always learning more about its audience. In June 2018, Phrasee launched its first US office in San Francisco. It works with major global brands, including Virgin Holidays, Gumtree and Domino's Pizza. A year ago, I didn’t think creativity could be machine generated, how wrong I was." Despite the opportunities that automation and AI seem likely to bring to the workplace, the technologies do have their limitations, according to some of the experts interviewed by V1. Even though he’s positive about automation in his industry, Cromwell says that not everything in retail can be automated, while Koeman points out AI’s limitations. “AI is currently not nearly capable of something like critical thinking or higher order thinking,” he says. Koeman adds that there are some people in the industry who seriously doubt the ability to scale the more complex branches of AI like deep learning. Omni’s McLeod says he believes that the value of human salespeople is underestimated, and that automation will never be able to compete with a fully-trained worker in certain roles. Likewise, some roles are simply hard to imagine successfully automated. V1’s Radfar notes that creative jobs would be tricky to replace with a machine. “Storytelling and branding and a lot of creative product work, technical work is incredibly hard to [automate]” he says. With the amount of funding being invested into AI research, its capabilities stand to expand rapidly, even though today it’s hard to imagine all the tasks a machine could take on. “History shows there will always be some breakthroughs or fancy technological institutes or universities that actually overcome these problems,” says Koeman. AI and automation are making work more efficient. They’re allowing people to focus on priority tasks instead of having to switch between a number of activities. That means a higher quality of output in less time, and likely, less cost. Automation also makes it easier for colleagues to share information, which helps companies create a culture of collaboration and encourages feedback. It gives small companies a way to compete more nimbly against larger businesses, and provides reams of relevant data they can use to evaluate their progress. Project management applications, which make tasks and their status transparent, and tools that pass information between apps, give individuals and teams an edge. Instead of each person having to check in for every update, there’s a collective record of what’s going on, and a way to find out without interruption. Some managers also choose to automate daily meetings, while others argue it’s worthwhile for employees to have time together in person to connect. One of the challenges of automation, then, is finding the right balance between establishing the sense of comfort and camaraderie teams need to optimally work together, and the benefits automating different processes provide. Trying to automate more than employees can manage can lead to frustration, so having teams buy-in for automated tracking processes is central. Since automation and people will in many cases continue to work side by side, it’s important to keep people at the center of the equation. Unlike machines, people have responses to how they’re treated, and will react accordingly. Adding layers of automation slowly and deliberately makes it more likely that teams will readily adopt it. Large organizations can start by adding it in a small cell and then showcase the results to the rest of the company to demonstrate its benefits. Constantly promoting how the process has been helpful or valuable in identifying issues can further be useful in cementing its value to teams, especially when there’s pushback from employees who prefer to do things another way. Company culture is being distinctly impacted by the expectations of various generations of employees, as well as by diversity, the gig economy, and AI and automation. Individuals and executives who have the foresight to incorporate the knowledge of their peers on these themes into how they operate will be best-positioned to take advantage of the new work world that’s emerging. And the importance of acting on these trends cannot be understated. Great periods of change are opportunities for those who can take advantage of them, but perilous for those who ignore them. Employers can add value to their businesses by being prepared. Employees can make themselves more attractive to potential employers with the diverse perspectives they offer and skills they are open to incorporating. The future of work appears to be, in many ways, faster and more transient, with businesses growing more quickly and employees moving at a more rapid pace. It is also increasingly informed by new technologies that spur it ahead. By looking forward, everyone involved in the workplace can be ready for what happens next and also what is changing around them.